An experienced Iyer couple from Chennai (Who left his job after 30 years at HLL), a young entrepreneur just back after completing his degree in Hotel Management from Switzerland and his friend from the legendary Savera hospitality group, and a Ranji cricketer – When these four people with diverse expertise get together something unique is born. And that was Prem’s Graama Bhojanam. 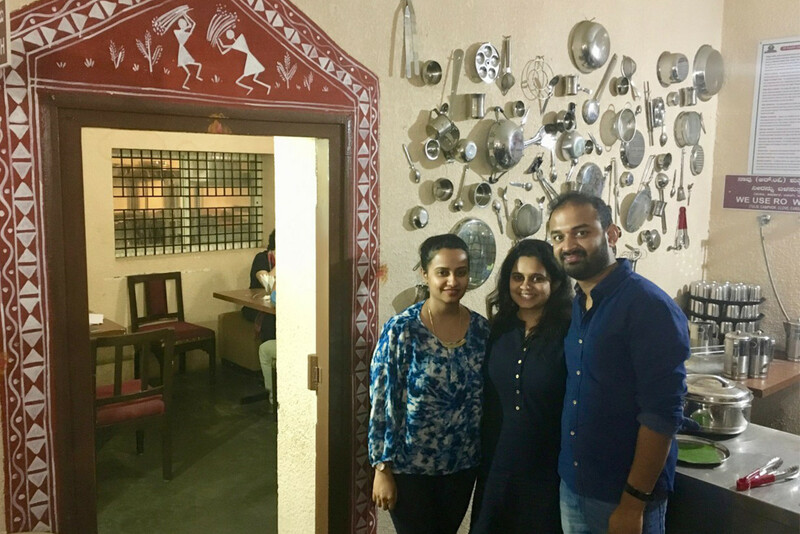 The restaurant at Jaynagar Bangalore leveraged on the expertise of Mr Krishnamurthy who started Prem’s Graama Bhojanam with his own cooking at a small place in the bye lanes of Adyar Chennai. Their goal is to promote healthy food with healthy ingredients. All the dishes here are made of millets and Red/Brown Rice. It definitely is more environmental friendly as growing millets requires 70% lesser water than rice. The first thing you must order here is their “Paddus” (“Kuzhi Paniyaram”) – They are delicious and healthy – made of “Samai” Little millets. Crispy outside and soft inside – you can gobble 3 – 4 of them easily. So ensure that you order more than 1 plate if you are in a group. At just Rs 80/- a plate you need not worry about the bill. Thats the beauty of this place – all the varieties of Idlis, Dosa’s, Vada’s and Bajjis are made of millets and they taste better. Of course they are healthier. They are also priced very reasonably. The signature dish is their Lunch and Dinner Thali that includes 4 Main Dishes – Sambar rice, Curd Rice, Rasam Rice and Rice of the day – Lemon / Puliyogare etc but all these “rice” items are made of millets. Then there is a Curry, Chutney, Sweet of the day, (Made with Jaggery), Buttermilk and Roti – all of this unlimited for Rs 195/-. Even the RO water is laced with Camphor, Tulsi, Clove and Cardamom. Food is cooked in a healthy way – all their products are sourced directly from Organic farms and there is no use of Vanaspati, Sugar, Maida and artificial colours. A lot of focus has gone on the menu and the accompaniments – and thats what is important. If you get the food and pricing right people will come – ambience is secondary. And they seem to be on track serving over 100 lunches every day and 200+ lunches on the weekend. The ambience is basic, functional and clean with an eye on costs. Prem’s Graama Bhojanam is expanding with a fine dining restaurant that opens in Chennai (Annanagar) on the 23rd of July and its a matter of time before they expand their footprint in Bangalore. They seem to be setting the trend with a handful of other restaurants in promoting Millet based food.